Experts from the United Nations University (UNU), a global think tank headquartered in Japan, have been warning environmental authorities in Mexico for a number of years now about the pollutants in aquifers threatening Mexico’s Yucatan Peninsula. This is the second of a two-part series on this issue. Currently, only one-third of Mexico’s Yucatan Peninsula uses municipal wastewater treatment systems and although reverse osmosis (which removes a wide array of contaminants including inorganic chemicals such as salts, metals and minerals, as well as most microorganisms and most inorganic contaminants) is widely used to treat drinking water, it does not remove all chemicals. The results of this study provide evidence that contamination is a concern and originates from a number of likely sources: illicit drugs (e.g., cocaine), pharmaceuticals (e.g., painkillers acetaminophen and ibuprofen) and personal care products (e.g., triclosan and synthetic musks) from domestic sewage; Polycyclic Aromatic Hydrocarbons (PAHs) from highway runoff and other impermeable surfaces; and chlorophenoxy herbicides from pesticides used on golf courses. While levels found are not considered a health threat at this time, the data raises some concerns about human exposure to bacterial, viral and parasitic pathogens and other contaminants from the consumption of drinking water. The researchers warn that a combination of sea-level rise and over-extraction of freshwater contributes to saltwater intrusion into the aquifers, thereby posing an immediate threat to the region’s freshwater quality and availability. 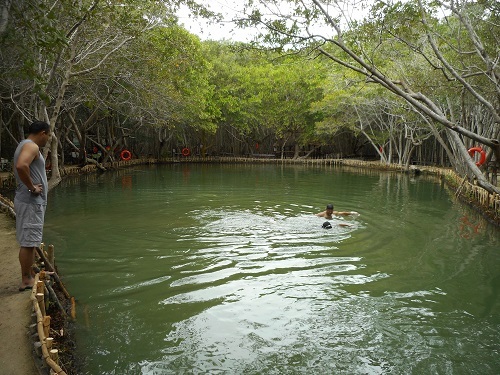 The planned growth of urban and tourism development in this region of Mexico will benefit from the adoption of mitigation strategies and Beneficial Management Practices (BMPs) to ensure that pollution does not pose a serious threat to the coastal ecosystems and human health, and thereby affect the economy. These findings clearly underline the need for monitoring systems to pinpoint where these pollutants are coming from. Prevention and mitigation measures are needed to ensure that expanding development does not damage the marine environment and human health and, in turn, the region’s tourism-based economy. Recommendations resulting from the study include the use of impermeable liners beneath golf courses, improved wastewater treatment infrastructure, prohibition of injections of treated sewage into saltwater below freshwater aquifers, and protection of remaining mangrove habitat, which buffer coastal areas from pollution. Land and water management in the region is fragmented, and is often ineffective in the face of pressure to develop the tourism and recreational industry. The results of the study were shared with local partners and stakeholders from both coastal and freshwater arenas, including the private sector, government and local communities. This led to discussions between local hotel owners, government officials (from both environment and public health ministries) and coastal management agencies on best management practices for reducing the likelihood of contamination. The study may be considered a step forward in this region since there is a general lack of expertise and equipment for monitoring or tracking sources of pollution and few administrative links between those responsible for water and coastal management and the labs that generate the (monitoring) data. Whether or not these aforementioned measures will actually be taken up by local or regional authorities is yet to be seen. It is important to note however that following the media release on this study at the start of 2011, the National Water Commission (CONAGUA) of the Ministry of the Environment and Natural Resources (SEMARNAT) responded with an official statement and plans of action to tackle this problem. This is a good sign. The researchers conclude that without integrated approaches to protecting and managing the aquifer, that are built upon participation by all stakeholders,”the tourism-based economy of the Maya Riviera region will not be sustainable over the medium to long term”. To find out more about this study, please refer to: Metcalfe, C.D., P.A. Beddows, G. Gold Bouchot, T.L. Metcalfe, H. Li, and H. Van Lavieren. 2011. Contaminants in the coastal karst aquifer system along the Caribbean coast of the Yucatan Peninsula, Mexico. Environmental Pollution 159:991-997. Phase 1 of the CCPP was funded by the World Bank through Canada’s Persistent Organic Pollutants Fund of the Canadian International Development Agency (CIDA); phase 1 completed in mid-2010. The United Nations University (UNU) is a global think tank and postgraduate teaching organization headquartered in Japan. The UN University works with leading universities and research institutes in UN Member States, functioning as a bridge between the international academic community and the United Nations system.